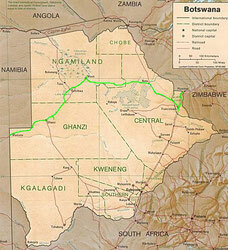 1,219 km of cycling - as part of a bicycle world trip - from the border with Zimbabwe via Francistown northwestwards, across Botswana westwards to Maun at Okavango Delta, scenic flight over the magnificent Delta and then on Trans-Kalahari Highway southwestwards across Kalahari Desert to the Namibian border. Do you like Cycling Botswana? I crossed the border and in the evening I pitched my tent in the bush beside the road. Next day I reached Botwana's second-largest city Francistown. The huge supermarkets probably anyway would have made any Africa cyclist coming from the north start crying for joy once he got a sight of this mind-boggling range of products in seemingly endless shelves full of everything he had dreamed of during the last months. But when in fact coming from Zimbabwe, this experience was simply stunning. In the meantime it got end of October and not surprisingly the raining season got closer and closer. On the way northwest more than once I found myself underneath tremendously huge and dark clouds and I had to cycle in the rain a couple of times. But once the sun was shining again, it instantly got seriously hot. From Francistown to Maun at nearby Okavango Delta in northwestern Botswana I had to cycle about 530 km across endless and flat bushland with just three small villages for water supply on the way. On mainly endless straight roads I cycled towards the horizon often without the slightest curve for kilometres. In Maun I followed Helen's invitation and pitched my tent at her incredibly inviting Old Bridge Backpackers Camp. I met Thomas from Germany who had cycled the world for more than five years before stranding here seven years ago and setting up a small computer service company. It didn't take a long time for us to figure out that we had emailed each other years ago. The Okavango River rised in Angola and flew across northern Namibia before losing itself in Botswana's Okavango Delta, a 16,000 sq km maze of channels, lagoons, wetlands and islands, in which annually about 18.5 billion cubic metres of water eventually simply got swallowed by the sands of the Kalahari Desert. Obviously there was just one way to fully appreciate this unique and huge ecosystem and so I chartered a Cessna prop plane together with a Canadian and a Belgium couple for getting an one-hour glimpse from above of at least a part of this delta. And what we got to see was simply breathtaking: We flew across a world of water and green, palm islands, waterways and grass- and swamplands with herds of elephants. We saw giraffes and other wildlife. It was like flying over a different planet, a world like paradise, pure nature. It was like having a view of mother earth how it possibly might have looked like if there were no human beings. Actually I had planned to join the guys from Canada on a two-day canoe safari through the eastern Okavango Delta, but somehow I got sick. So I just took the return motorboat ride on Duro River deeper into the delta. Maybe this decision was not too bad as it got thunderstorm and rain later in the afternoon. 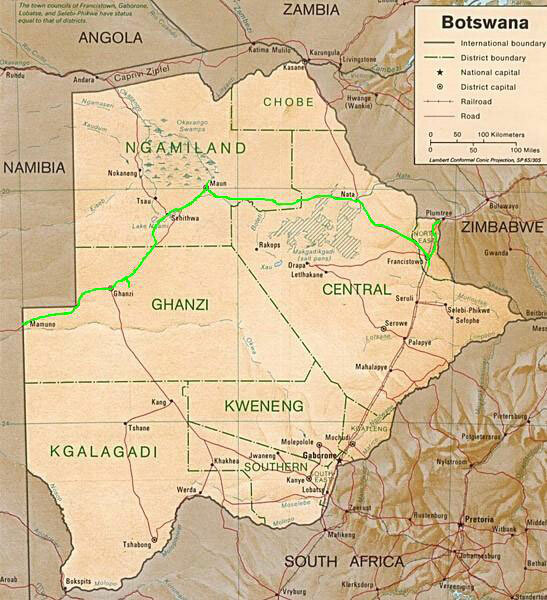 I felt better next day, so I got myself started heading southwest for the Namibian border. Four days I cycled across the endless and vast Kalahari Desert. I took an exhausting side trip on a sandy desert track to Dqae-Qare Game Farm, before crossing the border into Namibia in the middle of the Kalahari Desert. It had been a wonderful time in Botswana, but, or possibly better said because, except of Francistown and Maun I had been in the middle of nowhere for the whole time. Somewhere, nowhere in Africa.